For me, that’s the result of several things, including the lack of success of some of our elite men’s teams in recent times. Additionally, given some of the exceptional team and individual performances we have seen throughout 2018 from our women’s teams, it’s no wonder people want to get behind them. Add this to increased publicity, broadcast and coverage and you have a winning combination. Reflecting on this year, here are some of my favourite women’s sports moments. Despite playing interstate matches for several years, this year the NRL had its inaugural women’s State of Origin at North Sydney Oval. I know the Blues own that night, but I always have difficulty remembering the score. Maybe it’s because the details I remember are over a million people watching in broadcast, over 9000 in attendance at North Sydney and a crowd of people that swarmed the field after the game to catch a moment with new heroes like Isabelle Kelly, Meg Ward and Ali Brigginshaw. Despite how much success the Australian women’s cricket team have enjoyed in recent years, there was a distinct lack of silverware in the trophy cupboard before the ICC World T20 held in November this year. Australia defeated England in the final by eight wickets and Alyssa Healy won player of the tournament after several exceptional performances with both the bat and with the gloves. It may have been her best friend Alyssa Healy that shone at the World T20, but Ellyse has been in scintillating form since returning for the WBBL season this year. She scored her maiden WBBL century against the Perth Scorchers earlier in the summer and then backed it up with another against the Brisbane Heat a few matches later. It has led plenty to question why she was batting as low as seventh during the World T20 tournament (perhaps this indicates the depth of Australia’s batting line up). What a year for women’s rugby league. The State of Origin was just the beginning with the inaugural women’s competition beginning in September. The Brisbane Broncos, led by their outstanding skipper, Ali Brigginshaw, were crowned premiers, but most pleasing was the quality of every single game played and the emergence of some new talent, including the likes of Julia Robinson, Hannah Southwell, Holli Wheeler and Amber Pilley. This year saw Rugby Australia demonstrate increased support for our women’s XV team, the Australian Wallaroos. In August this year the Wallaroos played a match against the Kiwi Black Ferns in a double-header event with the Wallabies. This was the first time that the two teams had played a double header on Australian soil and it was also the Wallaroos’ 50th test match. I hope to see continued support for the Wallaroos in Australia despite Rugby Australia losing a bid earlier this year to host the next Women’s World Cup. Already much loved in Australia, this was the year Jessica Fox became the most successful female paddler in history after she won two world crowns in October at the canoe slalom world championships in Buenos Aires. With those wins, Jess now has nine world titles, which incredible eclipses her mum, Myriam Fox-Jerusalmi, as the most successful female canoe slalom paddler. I have a feeling she isn’t done yet either. They are known as one of Australia’s most well-loved teams, and Sam Kerr is one of the best footballers in the world. 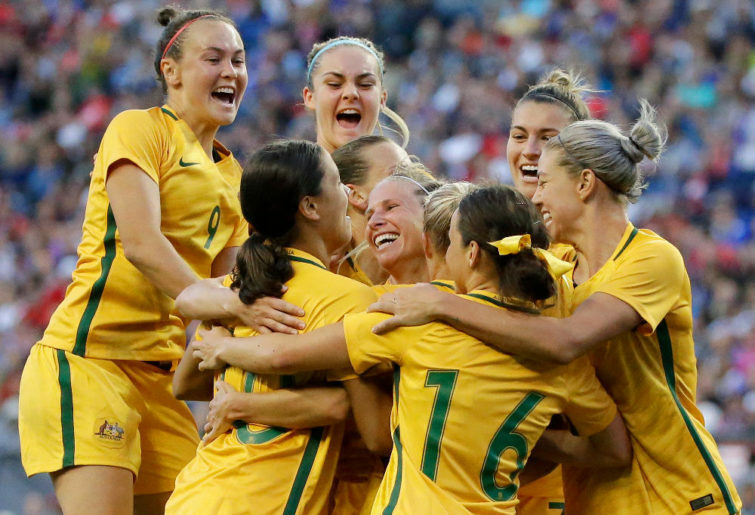 While some will be disappointed that the team lost to Japan at the Women’s Asian Cup this year, in that tournament the Matildas secured their spot for the 2019 World Cup in France. I’m certain that Alen Stajic and the squad have their eyes firmly locked on this tournament, and that excitement will continue to build as we get closer. Stephanie Gilmore will always be remembered as one of the world’s best-ever surfers after her continued success this year, including a seventh world title. This saw her draw equal with Australian surfing legend Layne Beachley. Some of you may not have heard of Melissa Perrine. Melissa is a para-alpine skier, and this year she won her first-ever Paralympic medal after three games. Mel and her sighted guide, Christian Gieger, won bronze in the vision impaired super-combined at the Winter Paralympic Games earlier this year. Incredibly she then went on to win a second bronze medal in the giant slalom race. Incredibly, earlier this season, Liz Cambage made WNBA history when she scored an all-time record 53 points in one game to lead the Dallas Wings to a 104-87 point win over the New York Liberty. Unbelievably, the most recent NBA player to post 50 points or more was Michael Jordan back in 1996. With 2019 set to be another big year, with the continuation of the Super W, the AFLW, WBBL, WNBA, NRLW and W-League, I’m still confident that when it comes to women’s sport, the best is yet to come.